The following article appeared in the Ottawa at Home Magazine in the Summer 2017 edition. All photographs are credited to Mark Holleron. 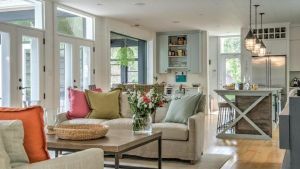 A newly built cottage on the Big Rideau Lake was infused with a family’s love of design when a young interior designer teamed up with her stylish aunt to combine contemporary creativity with years of home renovation and decorating experience. Sarah Taggart, who works with Leonhard Vogt Design, enjoyed collaborating with her aunt Vicki Taggart, a property manager who has been involved in a variety of home design projects. “I admire her style – she has such great taste and a good eye for design,” says Sarah, adding that they were given considerable creative freedom on the interior design theme, furnishings, fixtures and all finishes. The large and airy two-storey cottage with four bedrooms was built by John Riley Construction from architectural plans by Barry Hobin. It has a classic Cape Cod design, with silver-grey cedar shakes and dormer windows, to suit a grand lake house designed for year-round use. To blend the interior with the exterior style and setting, natural stone and wood elements were brought inside along with Sarah’s inspiration to create a breezy essence of Martha’s Vineyard, while maintaining a true cottage vibe. Reclaimed barn board from a hundred-year-old barn in Greely was used in many areas of the home, including ceiling beams and on a kitchen island which Sarah designed. 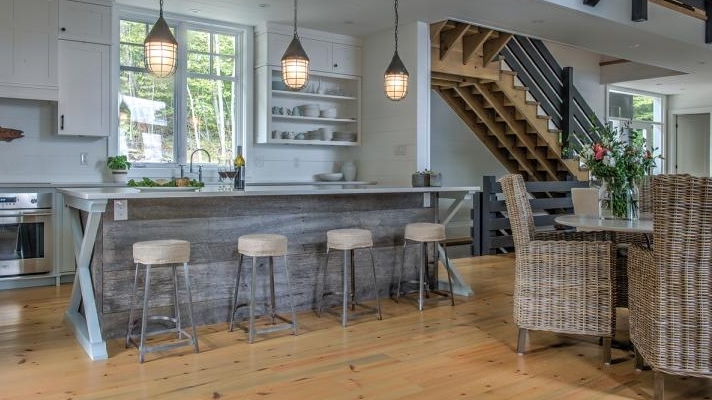 The barn board accent on the island adds a rustic contrast to the white Caesarstone countertop and wall cabinetry, all supplied by Muskoka Cabinets, and offering a light, fresh appeal. The open-concept living space accommodates large family gatherings, and leads to a stunning sun room with distinctive features. Amish-made cedar shakes accent the walls, cherry wood window trim is painted in a sleek Raccoon Fur tone, large megastone tiles cover the floor and carry through to an outside patio with a gorgeous view of the lake. 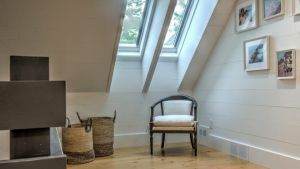 White paneling on the walls and ceilings is used extensively throughout the cottage for a classic Cape Cod feel. It’s a design element that was similarly influential in Vicki’s own cottage. Her pièce de résistance is an amazing chandelier in the sun room that she discovered while visiting Huntsville in the Muskokas. An individual touch with contemporary cottage flair is a talent that Sarah applies in unexpected areas. A sleek bathroom tub is encased in dark imitation wood, which is actually porcelain tile that extends to the flooring. “We used the darker tile from Astro Design in the Jack and Jill bathroom, and white tile in the ensuite bathrooms, says Sarah who adds that the vanity mirror frames were custom made by John Riley from the left-over barn board. The staircase was also given special Sarah treatment. “We wanted to do something a little unusual and dramatic to break up the predominantly white décor. 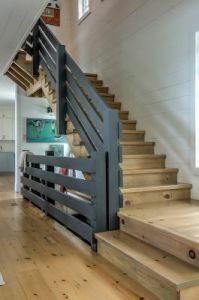 The staircase posts and spindles are slightly tapered for an imperfect look, and we carried through with the Raccoon Fur trim colour from the sun room.” A natural stain was used on the steps, which like all the reclaimed pine flooring, is from Logs End. Overall, Sarah and Vicki went for a neutral décor with strong pops of colour taken from an abstract, landscape painting in the living room by Montreal artist Nina Cherney. They brought in orange, yellow, turquoise, fushcia and lime green in throws, pillows and accessories with some pieces sourced locally from Hay Design in Perth.